Soy in South America constitutes one of the most spectacular booms of agro-industrial commodity production in the world. It is the pinnacle of modernist agro-industrial practices, serving as a key nexus in food–feed–fuel production that underpins the agribusiness–conservationist discourse of "land sparing" through intensification. Yet soy production is implicated in multiple problems beyond deforestation, ranging from pesticide drift and contamination to social exclusion and conflicts in frontier zones, to concentration of wealth and income among the largest landowners and corporations. 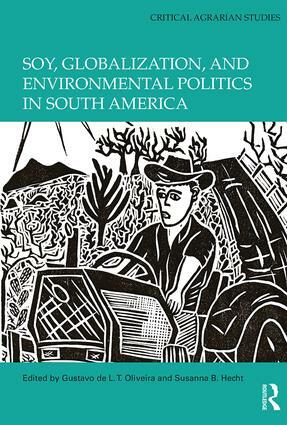 This book explores in depth the complex dynamics of soy production from its diverse social settings to its transnational connections, examining the politics of commodity and knowledge production, the role of the state, and the reach of corporate power in everyday life across soy landscapes in South America. Ultimately, the collection encourages us to search and struggle for agroecological alternatives through which we may overcome the pitfalls of this massive transnational capitalist agro-industry. Gustavo de L. T. Oliveira is a PhD candidate in the Department of Geography at University of California, Berkeley, USA. His dissertation analyses the political ecology of Chinese investments in Brazilian agribusiness and logistics infrastructure. He is a member of the BRICS Initiative for Critical Agrarian Studies. Susanna B. Hecht is Professor in the Luskin School of Public Affairs and the Institute of the Environment at University of California, Los Angeles (UCLA), USA, and Professor of International History at the Graduate School of International Development Studies, Geneva, Switzerland. She is the author or editor of more than 16 books and numerous articles on the political ecology of tropical forests. Her book on Amazonian environmental history The Scramble for the Amazon and the Lost Paradise of Euclides da Cunha won the Melville Prize from the American Historical Association, and the Carl Sauer Award in Geography.